The 2017 Pure is the most complete crossover between freestyle and wave! The profile advancements provide an even more accurate pressure point at the bar. In addition the expanded C-Shape construction offers fast turning with precise and direct steering. This is why the Pure is the ultimate setup for ambitious Freestyle and Wave riders! Explosive and predictable pop combined with solid slack offer all the freestyle abilities you can imagine. Furthermore the kite recovers quickly on big kitelooops in order to ensure a soft landing. No matter if strapless or straps the good drift abilities of the Pure are essential for every wave rider. 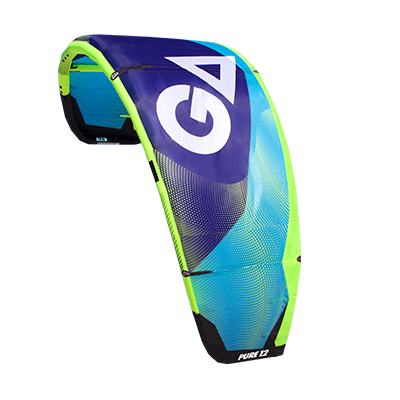 For 2017 we enhanced the quick relaunch and the big wind range characteristics for any advancing rider to fall in love with this kite. And in order to make this a long-lasting relationship we did not only make this kite lighter by a double spinnaker frame but also reinforced the leading edge with new patches and stiching.